When on Roatan recently, we decided to check out Fantasy Island Resort on a recommendation from our neighbor at the Resort at Palmetto Bay. 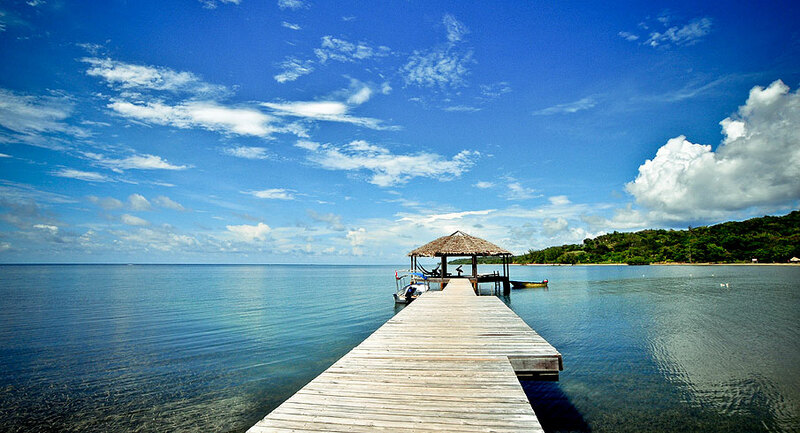 We are always looking for a new beach to try out and Roatan has a lot of them, one more beautiful than the next. Fantasy Island Resort offers a day pass and is a short drive from our home in Palmetto Bay. They offer two options, $15 for use of the beach, pool, kayaks and lounge chairs, including towels. The second option, which we chose, as we were planning on spending the day, was $30 and included the previously mentioned items along with a buffet lunch. We got there about 10:30 am and had our pick of chaise lounges and palapas on the beach. The beach was clean and the water was sparkling shades of blue. The turtle grass, so prevalent on the island, didn't start until about 25 feet out from the shore so swimming was not an issue. The water was calm and the swimming area, which was huge, was roped off so there was no worry about boats. The pool was a little small and we did not go in it, as we came for the beach and that is where we stayed. The bathrooms and the outdoor showers were easily accessible. The lunch is served either upstairs in the main building or at the open air palapa on the beach. Unfortunately, since we were there off season, the palapa wasn't open so we had to eat in the main building. The lunch buffet was good, with enough variety to satisfy everyone. You could chose to eat inside or outside on a shaded deck overlooking the beach with a beautiful view. A soda, dessert and coffee were included in the lunch. The rest of the day was spent lounging on the beach, swimming and walking around the paths on the property with beautiful views around every bend. There are supposedly monkeys, which we never saw and some chickens, which we did see. I guess the chickens were lonely for company as they planted themselves by our chairs for the day. We also did not snorkel off the gazebo, which I understand is amazing, because on that side of the resort, the water that day was a little rough for children so I didn't let my daughter and her friend go. Maybe next time. 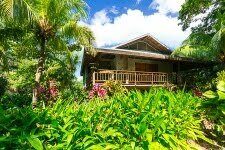 While visiting Roatan, rent the Tropical Garden Villa at the Resort at Palmetto Bay, our beautiful, updated 3 bedroom, 2 bathroom villa with private pool and steps from the beach. Check us out.